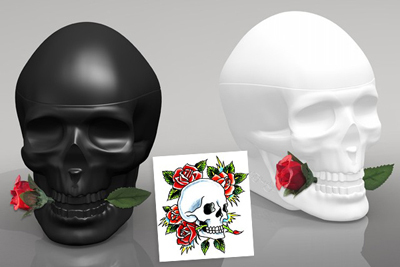 Ed Hardy is coming out with a Skulls and Roses fragrance duo for men and women. The men’s fragrance is supposed to be ozone based while the women’s fragrance is warm and sugary. Oh boy, another set of lame duck fragrances. I have to say the design principles arrived at for this one are–interesting. And by interesting I mean, “really tacky”. Keep in mind that this is just a 3D model of what the bottles will look like. I might add the 3D quality isn’t that great to begin with. So you can rest a bit in knowing that the physical bottles might not look quite so plastic. I can’t understand why something like this is even coming out. Still I’m going to smell it. Who knows, maybe the bottle and the juice will have a bit of a spat and the juice inside these skulls will be surprisingly good. Thanks to Refinery 29 for the image.